It's easy to miss a big instore book promotion when you live in the rural Tamar Valley but having read Salt and Honey by Candi Miller I'm not in the least surprised it was chosen to feature in one because it's a book to have and to hold and to savour. Despite the fact I have some cracking good reads on the go at the moment, Salt and Honey flatly refused to be interrupted and so I read it straight off over several sittings. Each time I put it down I was desperate to get back to it. The horrors of apartheid have been a part of life but from a remote distance, Ian Smith, Rhodesia, the Rivonia trial, Nelson Mandela all happened in the early 1960's when I was ten and too busy on my roller skates and reading Malory Towers to pay much attention.I picked it all up at the other end when Nelson Mandela was released and Desmond Tutu came to the fore. Coincidence would have it that the HV I work with returned from three weeks holiday in S.Africa yesterday and was completely overwhelmed by the country, the people and the heritage.We talked for ages about her trip to Robben Island and Kruger when really we were supposed to be discussing all the new babies that had been born while she was away, all the lives I'd saved and how much NHS joy and happiness I had imparted in her absence (those last two are a joke by the way, I've been too rushed off my feet to blink). So for me Salt and Honey has been quite an important book to read because I realise there is a wealth of unread African literature on my shelves that now deserves my attention. Why have I never read Cry the Beloved Country by Alan Paton? Or The Grass is Singing by Doris Lessing? Or The World That Was Ours by Hilda Bernstein? What stopped me reading Disgrace by J.M.Coetzee or more by Chinua Achebe when I had been so impressed by Things Fall Apart ? 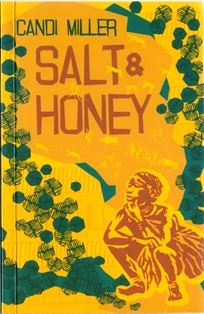 Well I have no idea, but Salt and Honey has proved to be the catalyst for an African literary journey and more suggestions welcome. Koba belongs to a remote Kalahari desert tribe and, having witnessed the brutal death of her parents at the hands of white hunters, she is captured and taken back to the Boer farm. Here a blessing awaits in the shape of the loving and understanding Marta who sees the injustice of the apartheid system and fights against it. As time goes on Koba becomes dear to everyone's hearts and the ending had me biting my lip and on the edge of my seat, it is moving to say the least. "Koba was neither black nor white, neither fully westernised nor tribalised in her attitudes or dress.To Marta, Koba was the future of South Africa"
I was completely and willingly emotionally captivated by this book.There are moments of excruciating agony and sadness, at times almost overwhelming but also moments of great wisdom, clarity and hope as Candi Miller focuses on the bigger picture.It's a well written story that demands attention and I needed frequent pauses to allow for some recovery time. Even more fascinating is the background information at the end of the book, no not reading group questions thank goodness but a glossary. Actually glossaries often irritate me too (sorry, honestly I'm always moaning) because I much prefer a book to give me a few clues to try and deduce what the word may mean, but that just wouldn't have worked here. So much Afrikaans is used to such good effect that you need the dictionary at the end. This is followed by some very useful information on the click consonants in the San languages.It is only in recent years that linguists have developed a method of representing these in print so the book is littered with /Ton, N#aisa and Kh//'an with a helpful DIY click guide at the end. I'm almost as proficient in clicking as I am in Icelandic, apart from my gutteral alveopalatal click as in !Xam which can sound and look as if I'm about to gag and would doubtless frighten most Ju/'hoansi and have them rushing to get me a bucket.I must search out some recordings of it because it must be magical and impressive to hear. 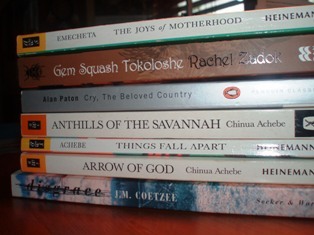 So 5* and thanks to Salt and Honey and Legend Press some more African reading is prescribed over the next few months and I think, before I set too on that pile, I might just start at the beginning with a re-read of Olive Schreiner's The Story of An African Farm, then perhaps Out of Africa by Karen Blixen.